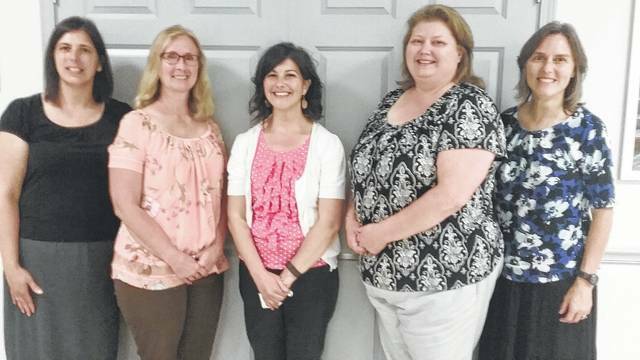 Teachers selected to receive the grants for their classrooms are, from left, Melissa Printz, Calvary Christian, Jana Core, Indian Lake, Rebekah Troyer, West Liberty-Salem, Barb Kuck, Benjamin Logan, and Donna Brunner, Bellefontaine City. Absent from the picture is Marie Baughman, Riverside. Six area teachers were selected to receive $250 grants to use in their classrooms. The Lucy Brown grants are funded by Emerson Brown in memory of his wife, who was a teacher for many years. One grant was given to each school district in Logan County. The elementary and middle school teachers who received the grants instruct in areas of science and language arts. The grants will be implemented during the 2017-2018 school year. The teachers received their money and gave a brief overview of their winning grant at the June meeting of Logan County Retired Teachers. Submitted on behalf of the teachers.